I had someone say to me the other day that my art was abstract, merely colors, and I told him no, each painting is Something, you just have to look it a little longer than the normal painting, for that something to come up. 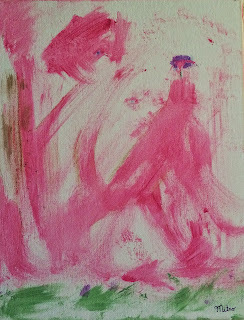 A case in point is my Coming Out painting, at first glance it appears to be merely a swirl of pink, but if you study it, the image will come up. The image is of a slender man, a boy really sitting up against the trunk of a tree, you can see his knees bent and he is holding a purple flower in his hands, He has a big flop of hair and if you look between his bent knees you can also see his mothers face also looking at the flower that her boy is holding. Each of my painting are the same thing and my paintings are never compete until they are something. If you are having trouble finding that something a good tip off is the title. I give away the subject in each title. My painting also contain many hidden complex images and the longer you look at the painting the more they will appear to you.